← Real-Time Visibility: Necessary or Cover Up? 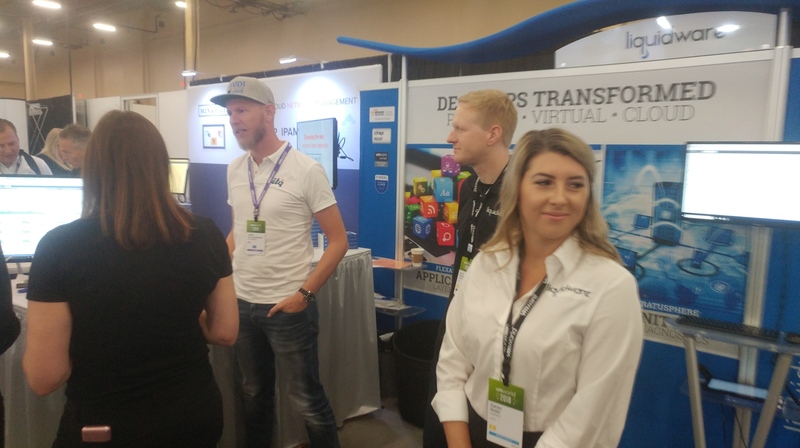 The first day of VMworld 2018 started for Liquidware with an event for EUC VIPs known as The Inside Track. Co-sponsors of this event include other notable vendors in EUC including NVIDIA, Stratodesk, and Amazon AWS WorkSpaces. The sponsors briefed this tight knit group of our announcements a few days before the show so this was purely a social event at Topgolf MGM. We had a great time. Take a look and see if you notice any familiar faces. The opening reception of VMworld was next and booth traffic was brisk. One thing that all of our staff noticed is that there were more meaningful EUC conversations happening on the floor this year. The second day of the show brought a lot of great meetings in our meeting suite and at the booth. Kevin Cooke and I spent some time with VMblog and were able to share Liquidware’s recent and upcoming product updates. You can watch the video interview here. On Monday night we hosted a customer, partner, and prospect dinner at Tender, it’s a tasty prime steakhouse at the Luxor. We had a great turnout. We did not bore with endless PowerPoint slides but did give a brief 10 minute overview of the suite and told about what’s new. Otherwise we just thanked our partners and customers and had a great relaxing dinner and great conversations about how top customers are using our Liquidware Essentials Suite. Back at the Liquidware booth, we had Johan van Amersfoort signing his new book and we were giving 100 of them away free to attendees with a desktop project. The books went fast! Johan’s book was also offered in the VMworld bookstore but sold out on day one! It’s on Amazon if you did not see us and would like to get a copy. On the final day we gave away that “vintage” VMworld 2005 unused backpack that I mentioned earlier. It was complete with many of the conference items I received at that show including a Windows Server 2003 DVD and license, a “new” pack of Microsoft TechNet playing cards and an unopened PlateSpin Hurricane Katrina benefit bracelet. Chris Hildebrant, also of VMmug fame won it. We also had great alliance interaction with LG, Amazon AWS, IGEL, Stratodesk, Microsoft, Citrix, and VMware. All in all it was a great show for Liquidware. We’re pleased that conversations around EUC, including Microsoft, Citrix, VMware, Nutanix, and Amazon AWS WorkSpaces desktops continue to grow at this conference!